, an English artist of very considerable merit, was born at London, in 1646, and, instructed in the art of painting by Fuller and Zoust. Lord Orford asserts, that he was one of the best native painters that had flourished in England; and that there are draperies and hands painted by him that would do honour either to Lely or Kneller; the portrait of the lord-keeper North, at Wroxton, being in every respect a capital performance. After the death of sir Peter Lely, he advanced in the esteem of the public, and had the honour to paint the portraits of king Charles II. king James and his queen, and was appointed state painter. He made nature his principal study, without adopting the manner of any master, and as far as | he thought it prudent he improved or embellished it in his pictures; and, like many other men of parts, he seems to be more respected by posterity, than by the age in which he flourished. He was, in truth, humble, modest, and of an amiable character. He had the greatest diffidence of himself, and was easily disgusted with his own works, the source probably, says lord Orford, of the objections made to him. With a quarter of Kneller’s vanity, he might have persuaded the world he was as great a master. The gout put an end to his progress, for he died in 1691, at the age of forty-five, and was buried in Bishopsgate church, in which parish he was born. 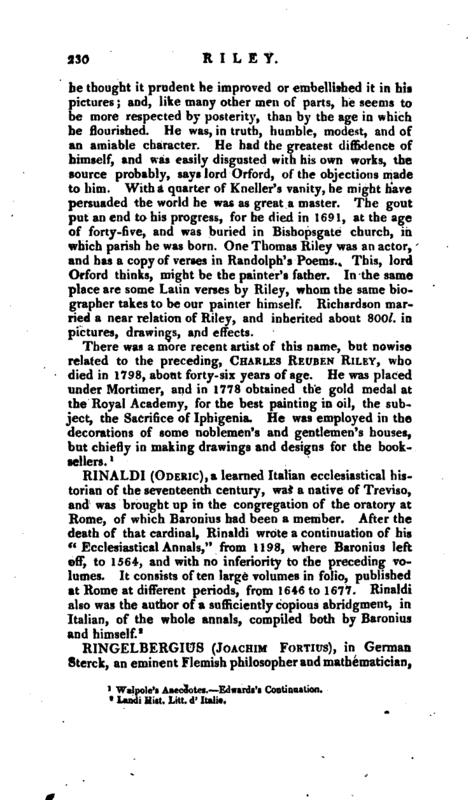 One Thomas Riley was an actor, and has a copy of verses in Randolph’s Poems. This, lord Orford thinks, might be the painter’s father. 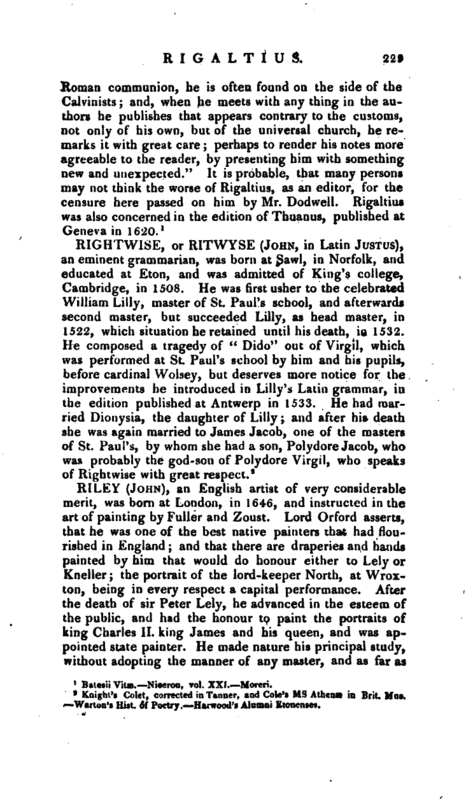 In the same place are some Latin verses by Riley, whom the same biographer takes to be our painter himself. Richardson married a near relation of Riley, and inherited about SOOl. in pictures, drawings, and effects.